Wash the zucchini and slice them by length. Salt and set for a couple of minutes. Dip the zucchini in flour and shortly fry in hot oil. 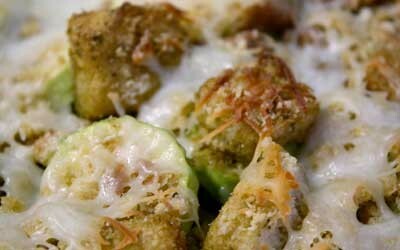 Arrange the zucchini in an oven proof dish and cover with sliced mozzarella. Repeat. Mix the eggs, milk and sour cream and pour over the zucchini.